Known for over a decade as the leading AV installation specialists in London, Pro Install AV work with both private homeowners and industry professionals like to design, create, and maintain cutting edge audio visual solutions for both commercial and residential properties. Whether you’re a homeowner planning to upgrade your outdated system and develop your new dream smart home, a building contractor or property developer looking for a new USP that’s sure to guarantee premium profits on your latest project, or an electrician tasked with carrying out a custom audio visual installation, we’re here to help. From state-of-the-art home cinema design to the latest multi-room sound systems, your London AV installer will work directly with you to create a custom audio visual installation designed to compliment and enhance your lifestyle. Ongoing, after-sales service, including pro-active and reactive tech support. Why Transform Your Home with AV System Design From Pro Install AV? Our qualified AV installers love nothing more than helping homeowners like you to develop the smart home of their dreams. As such, we really take the time to get to know not only your property and existing AV system, but also the lifestyle of you and your loved ones. Combining this knowledge with over a decade’s experience in audio visual design, we create a unique system through which you can experience the music, movies, and entertainment you love the most in a way you never before thought possible. Imagine your favourite tracks, streaming via Spotify in glorious high definition sound which follows you from room to room. Imagine catching the latest Game of Thrones series on Netflix in a state-of-the-art home cinema whilst your partner simultaneously indulges in the latest Sky box set, all without compromising the exceptional quality of your viewing and listening pleasure. With Pro Install AV, there’s no need to imagine. Contact us online today, or call now on +44(0)20 7096 0078, and let’s talk about turning the home of your dreams into a reality with custom AV design and installation. You don’t have to be planning on transforming your smart home to take advantage of Pro Install AV’s industry-leading expertise, custom made systems, or the kind of strong partnership with leading AV manufacturers that results in lower costs for your project. Ongoing quality control for the peace of mind of you and your clients. 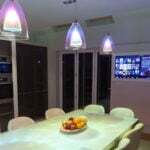 At Pro Install AV, we boast successful partnerships with the world’s leading manufacturers of audio visual technology. Work with us, and your new bespoke system can be created using one of -or a combination of- the following manufacturers. To discuss audio visual design for your commercial property, talk to Pro Install AV on +44(0)20 7096 0078 or contact us today to arrange a free consultation.